The Vashikaran Vidhi for casting this Vashikaran Spell on a desired man or woman for any purpose whatsoever is described below in this post. 1] The Vashikaran Yantra Prayog has to be performed on the Midnight of Ravivar or Sunday. 2] Kabootar Ki Beet has to be dissolved in proportionate quantity of water to prepare the ink for drawing the Yantra. 3] Then, using the Pigeon droppings ink, the Bahattar Ka Vashikaran Yantra has to be drawn on a Bhojpatra with a pointed wooden stick. 3] After this. 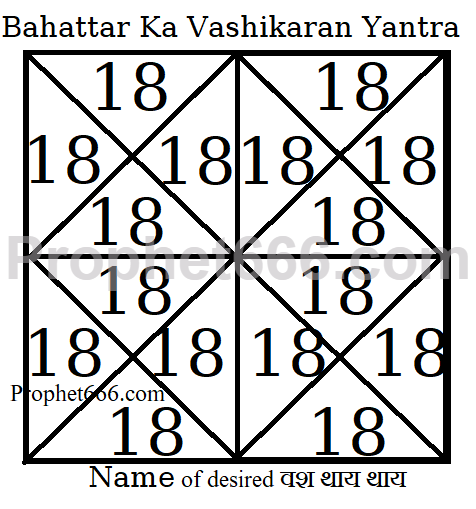 The name of the desired person has to be written below the Yantra followed by the words in the Hindi language – वश थाय थाय. If you wish you can write the numbers in Devanagari script. 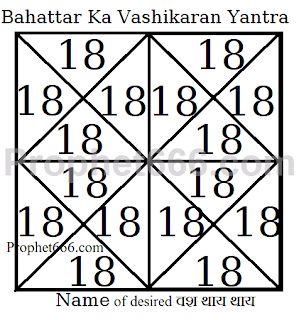 4] Then, the Vashikaran Yantra has to be kept on a board and some Kabootar Ki Beet should be lit in-front of the Vashikaran Yantra as Dhoop. The Vashikaran Tantra says that practicing this Vashikaran Prayog on any man or woman will make that person come under the strong Love-Attraction Spell of the practitioner and behave and act as per the wishes and commands of the practitioner. The Bahattar Ka Vashikaran Prayog can be practiced for any kind of Vashikaran, including love and business. Where to keep this yantra, once prepared? It can be kept in any place, but not the Puja Ghar, after your work is done, you can immerse it in a river or any flowing water body.